Lahore, Punjab Examination Commission is going to start the annual exams of primary class for the year 2014 from February 06, 2014. 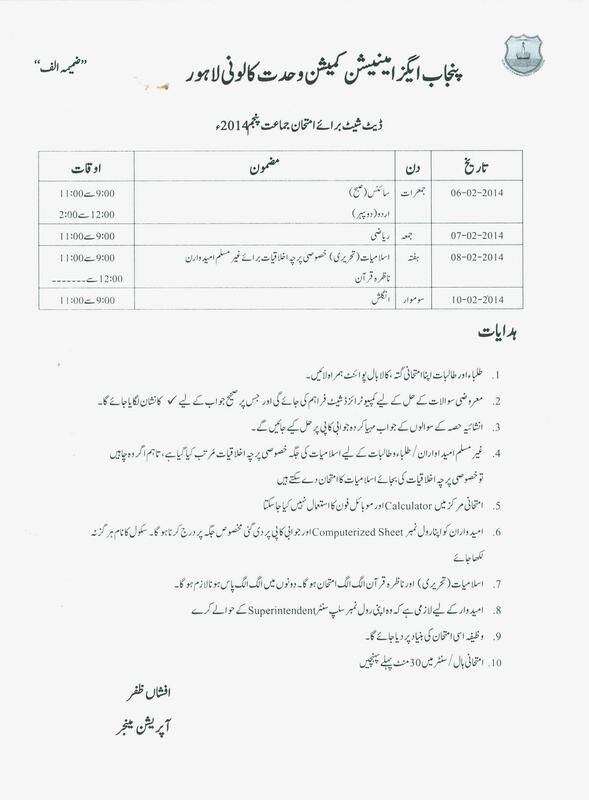 PEC has also released the date sheet of the annual exams of 5th class and the papers will be conducted in two shifts. The first shift will be started from 09:00 am and end at 11:00 am. The second shift will be started from 12:00 and it will be continued till 02:00 pm. all the candidates will have to reach the exams centers 30 minutes before the beginning of the exams and they handover the roll number slips to the exams center superintendant. When the papers will be started, they will be given the computer generated sheet for the objective papers and they will have to solve the paper on the sheet. The students should write the roll numbers on the space provided for the purpose but they should not mention the names of their schools. First paper will be Science, which will be held on 6 Feb 2014 in the morning and Urdu papers in the second shift on the same date. The Mathematics paper will be conducted on 07 February 2014 in the morning and it will be the sole paper on that day due to Friday. The next paper of Islamiat (written) which will be conducted on the 8th Feb in the morning or first shift and in the second shift, the paper of Nazra Quran for the students. The non-Muslim students will appear in the special paper of Ethics. But they can also appear in the paper of Nazra if they like to appear in it. There will also be sole paper of English on 10th Feb 2014, which will be held in the morning. PEC has also issued some instructions and the candidates should abide by all these instructions. They students will bring their writing material with them like board and black color ballpoint. The candidates cannot use the calculator and mobile phone in the exams center. The scholarship will be granted to the students on the basis of the result of this exams.